The United National Party (UNM) and non-governmental organizations (NGOs) held a rally on May 16, asking the Mayor of Tbilisi Davit Narmania for road rehabilitation. The rally had the form of a performance and was aimed at atattracting attention of the Mayor’s office to problems with the city's roads. The protestors placed different transparencies in the pits on Thedore Mgvdlis Street and complained that the roads are in poor condition, which complicates the movement of transport in the capital. The member of the UNM Irakli Abeasdze stated that there are no objective circumstances hindering the rehabilitation of roads. According to him, the government is incompetent. “Sometimes they forget to announce a tender and roadworks are given to companies which do not have experience or to the companies, where the officials have personal interests,” Abesadze stressed. The establisher of the NGO Apriori, Beso Shengelia, said that Narmania is not interested in road problems and hoped to attract the Mayor’s attention through demonstrations. 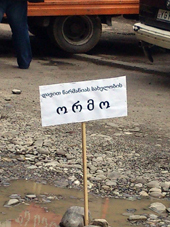 Davit Narmania explained the reason for the delay in the road works and responded to the demonstrators saying that from the following week the rehabilitation of 8 roads would begin. He said that 4 million GEL was going to be spent on roadworks. “Two participant companies sued each other and had the dispute in court, which delayed the process of road rehabilitation for three weeks,” he said. According to the Mayor, the case is in its last stage and the winning company will start its work very soon.